May Singhi Breen and Peter DeRose. 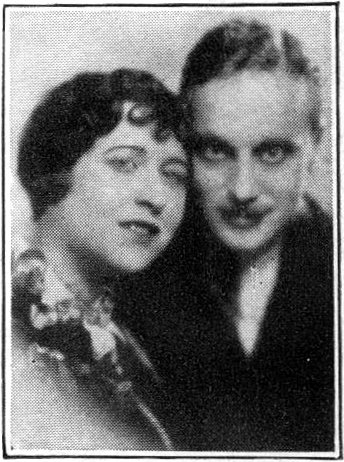 From 1932 publication. For your hopeful enjoyment today, I offer you yet another dance band double feature, this time two Electradisks. As with our first Bluebird double feature, these two are consecutively numbered, one catalog number falling immediately after other. Electradisk was the RCA Victor Company’s second venture into the field of budget records, following the failure of Timely Tunes. Electradisks were introduced in 1932 and originally offered in an eight inch format (which is very rarely seen today) along with a prototypical Bluebird of the same format and sold at Woolworth’s dimestores. Soon, both Bluebird and Electradisk were upgraded to the standard ten inch format, which seems to have sold better, though Bluebirds of that period are still impossible to find. 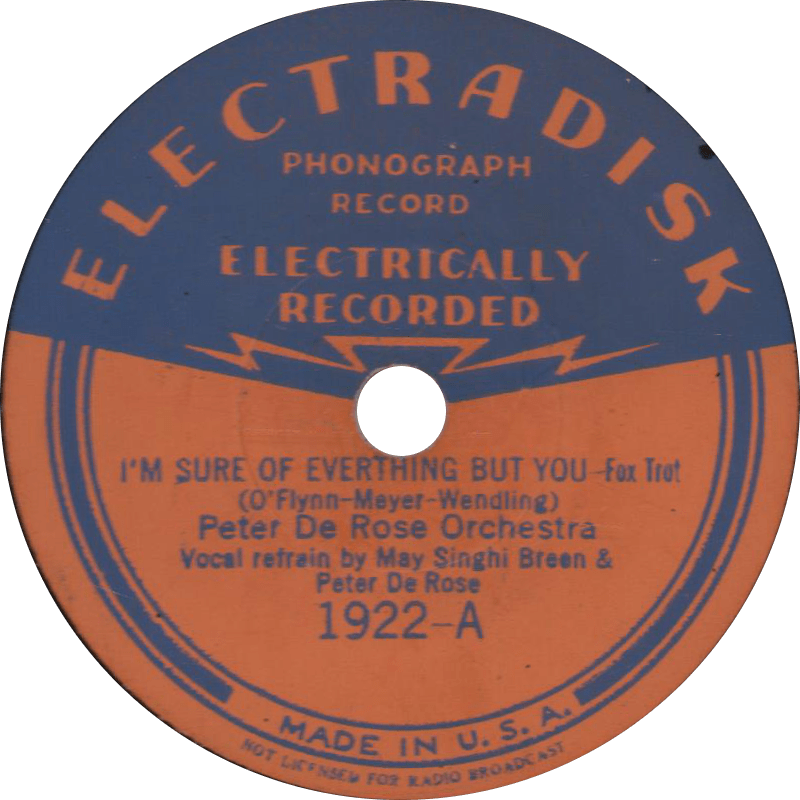 The Electradisk label continued into 1933, and was discontinued in that same year. Around that time, the “buff” label Bluebird was introduced, and began huge success and a mainstay well into the 1940s. I’m Sure of Everything But You, recorded November 22, 1932 by Peter De Rose Orchestra. …and on the flip, “Underneath the Harlem Moon”, with a vocal by the Marshall Sisters, no doubt trying to capitalize on the success of the Boswell Sisters (though they’re nowhere near as good, sorry to say). 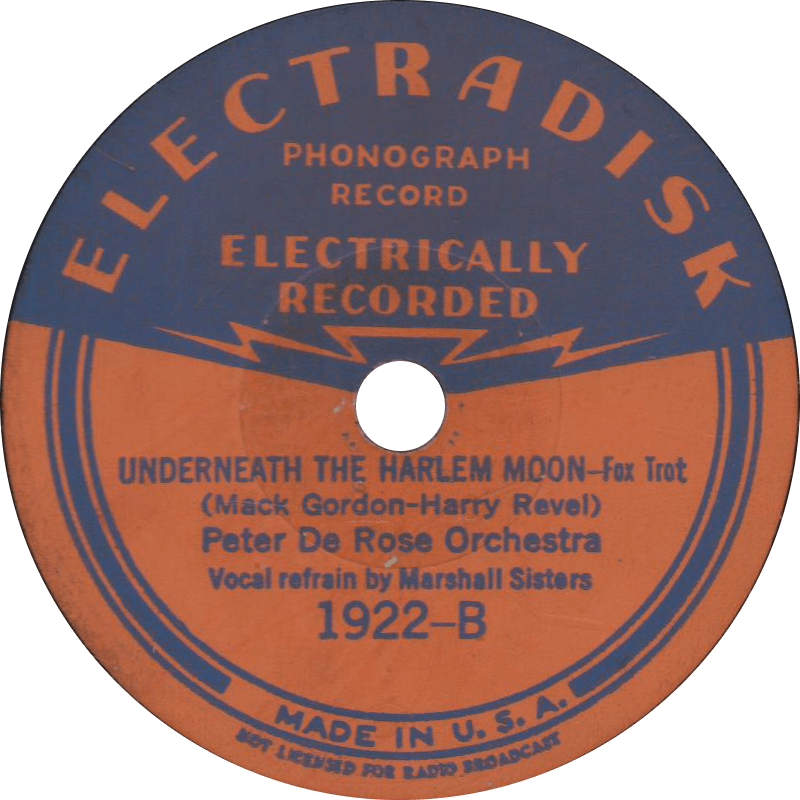 Underneath the Harlem Moon, recorded November 22, 1932 by Peter De Rose Orchestra. The second disk splits up its artist credits to Jim Harkins and his Orchestra and Sid Peltyn and his Orchestra, but once again, both are pseudonyms for Tom Berwick’s band. 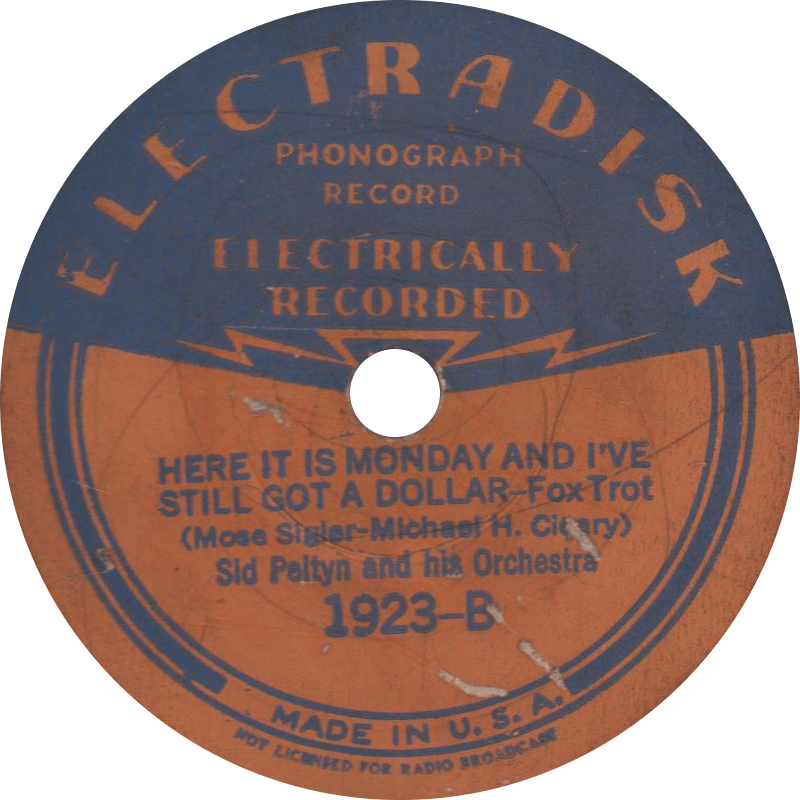 Both sides of Electradisk 1923 were recorded November 23, 1932 in New York. 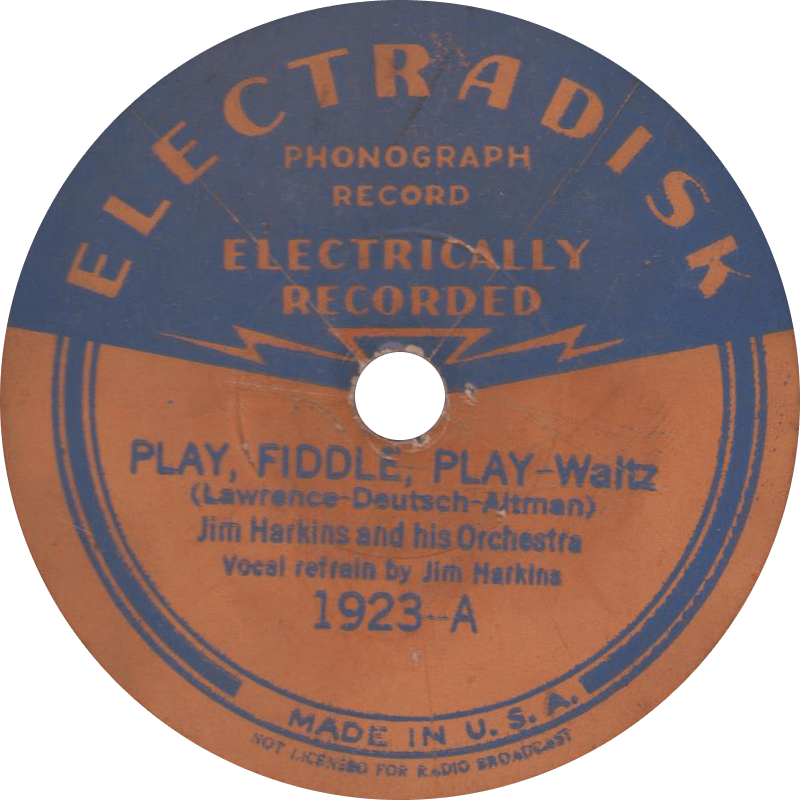 On the first side, “Harkins'” orchestra presents a respectable rendition of the 1932 popular song “Play, Fiddle, Play”, featured by the likes of “Street Singer” Arthur Tracy. According to the distinguished Mr. Paul Lindemeyer, Harkins was a Boston area banjo and guitar player who doubled on the bagpipes. Play, Fiddle, Play, recorded November 23, 1932 by Jim Harkins and his Orchestra and Sid Peltyn and his Orchestra. On the flip, “Peltyn’s” band plays the Great Depression topical song “Here it is Monday and I’ve Still Got a Dollar”. Here it is Monday and I’ve Still Got a Dollar, recorded November 23, 1932 by Jim Harkins and his Orchestra and Sid Peltyn and his Orchestra. Updated on April 28, 2018. This entry was posted in Records and tagged 1930s, 1932, Dance Band, Double Feature, Electradisk, Great Depression, Jim Harkins, Marshall Sisters, May Singhi Breen, New York, Peter DeRose, Popular, Rare Labels, Sid Peltyn, Sweet Music by R. Connor Montgomery. Bookmark the permalink. “Distinguished” pshaw, that just means I look my age! But thanks. I am reasonably sure Tom Berwick wasn’t a real human being. I know Sid Peltyn was – a trumpeter from Brooklyn and a sometime Gene Kardos sideman. About the supposed 8″ Bluebird records: none has ever been found, at least not by anyone who wanted the find made public! I have since learned that the original 8″ Electradisk records, #1800-1809, as well as a concurrent 10″ bloc #2500-2509, were test marketing ventures and only sold at certain Woolworth’s stores in New York City in July, 1932. Any 8″ Bluebirds that turn up would have been part of the same test.